McKenna”s face shows how much fun it can be! The City of Wilmington Parks and Recreation, along with No Child Left Indoors volunteers, are hosting a “Fishing with Mom” program on Saturday, August 8. The program is made possible by an Ohio Department of Natural Resources Aquatic Education Grant. The event combines fishing instruction, especially geared toward first-timers, an educational program and a freshly prepared healthy lunch. This is the perfect opportunity for moms, aunts, grandmothers or other female guardians to introduce children ages 5-14 to the fun of fishing. No experience is required. This is a free program for participants and fishing poles and bait will be provided. The program begins at 10 a.m. near Shelter A at J. W. Denver Williams Memorial Park. 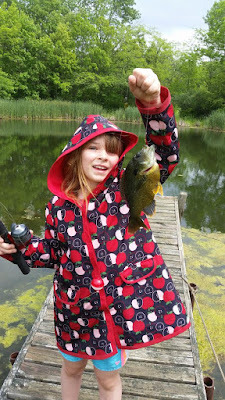 Registration is required and available at http://bit.ly/Fishingwithmom. For more information call Lori Williams at the Park Office, 382-4781.